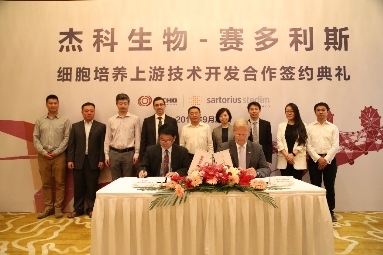 Shanghai｜Tianjin, September 21st 2017-- Jecho (Tianjin) Biopharmaceuticals Co., Ltd. and Sartorius Stedim Biotech China announced that both parties have officially signed the agreement on the development of upstream cell culture technology and have established close strategic partnership. Today, both parties held the signing ceremony at Hilton Tianjin Eco-City Hotel. The partnership will be aimed at developing cells culture process in the field of genetic therapy treatment. The breakthrough of large-scale cell serum-free suspension culture technology is the key to developing new targeted gene-based medicine and the therapy based on the production of recombinant vaccines. Therefore, the two parties will utilize automatic high-throughput cell culture platforms and online monitoring technology to conduct integrated technical research. The cooperation expects to make breakthroughs on technology in this field and enhance the research, development and production capacity of tumor-targeted medicine in China. Sartorius will provide Jecho with cell culture equipment platforms covering the stages of R&D, pilot testing and commercialized production, and will provide strong technical support based on its rich experience in cooperating with global pharmaceutical companies. T this cooperation featured in innovative technology will help the precision medicine to take off in China. Jecho Biopharmacals is the first company invested in China by Jecho Laboratories, Inc., an American biopharmaceutical company. Located in Sino-Singapore Tianjin Eco-City in the Tianjin Binhai New Area, it is now establishing a world-class R&D and production base for biological medicine. The base will be constructed in two phases. It focuses on researching, developing and producing innovative biological medicine to treat critical illnesses ( i.e. cancer and infectious diseases). At present, the first-phase construction has come to the final stage. The project is estimated to generate a value of more than 500 million RMB and create 1500 jobs locally when completed. At the same time, the base will become an addition to the biopharmaceutical industrial chain in northern China, which will certainly create enormous returns and significant benefits. Sartorius Stedim Biotech is a leading international supplier of products and services that enable the biopharmaceutical industry to develop and manufacture drugs safely and efficiently. As a total solutions provider, Sartorius Stedim Biotech offers a portfolio covering nearly all steps of biopharmaceutical manufacture. The company focuses on single-use technologies and value-added services to meet the rapidly changing technology requirements of the industry it serves. Headquartered in Aubagne, France, Sartorius Stedim Biotech is quoted on the Eurolist of Euronext Paris. With its own manufacturing and R&D sites in Europe, North America and Asia and a global network of sales companies, Sartorius Stedim Biotech has a global reach. For more information on Sartorius Stedim Biotech, please visit: www.sartorius.com.